In the US and Europe, major consumer and environmental organisations, such as Friends of the Earth, the Consumers Union, the World Rainforest Movement International and the Corporate Europe Observatory have already written to Ecover urging it to reconsider its decision (3). Over 30,000 people have signed petitions asking Ecover to reconsider its decision. In the UK, we do not intend to let Ecover get away with labelling its detergent as ‘natural’. 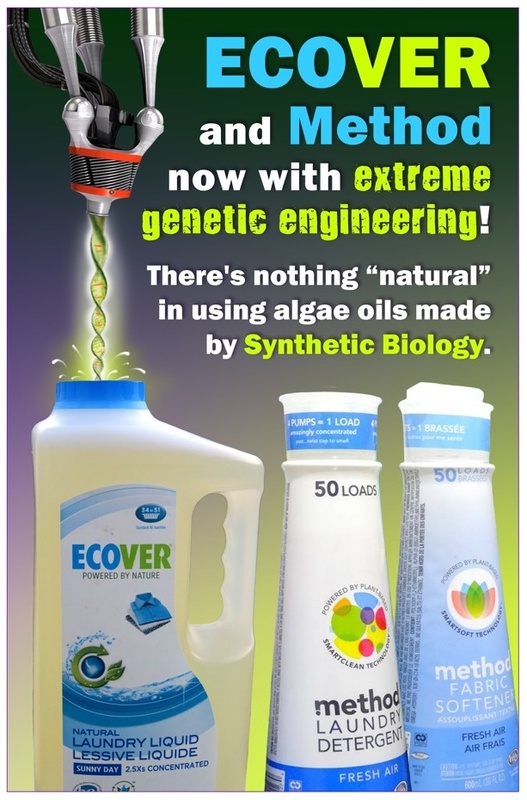 We urge people to sign the petition against the use of oils derived from synthetic biology at www.syntheticisnotnatural.com. Because ‘synthetic organisms’ will be so extensively modified, their ecological and human health risks may be novel and will be very hard to predict. We believe there is great reason to be apprehensive about the arrogance of a field that aims to rewrite life from scratch, as ‘genetically engineered machines’. Because this project raises such profound ethical, social and environmental issues, about which the public is currently poorly informed, we believe that the best approach would be a complete moratorium on environmental release and commercialisation of synthetic biology until the public has had time to properly discuss these issues and international oversight is developed. As the recent OECD report on synthetic biology notes (4), attempts to push ahead with it without such a discussion risk a repetition of the disastrous experience with GMOs. 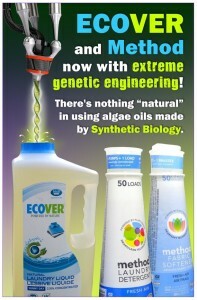 Ecover claims synthetic biology algal oil will be a more sustainable replacement for palm oil in some products. While palm oil is a leading cause of deforestation, these synthetic biology oils are actually not a sustainable alternative. Solazyme, the producer of these oils raises its algae on sugarcane. Increased demand for sugar could result in destruction of biodiversity hotspots, including Brazil’s fragile and biodiverse cerrado and tropical forests in Latin America, Africa and South East Asia, for more sugar cane production. This is why environmental and former groups in Brazil are already protesting Ecover’s decision. Ecover representatives have confirmed that the company has the option of switching to coconut oil, a feedstock that is often more sustainably produced by small farmers. The ingredient in question, lauric acid, is routinely sourced from coconut oil. For more information, contact David King on 07854 256040. 2. http://www.theguardian.com/observer-ethical-awards. We will be picketing outside the awards ceremony at One Marylebone (1 Marylebone Rd NW1, opposite Great Portland St Tube station) from 6.45 to 7.45pm today.